Most months this past semester, I seemed to be think ‘there is no way this video is going to get finished by the deadline. It’s just no possible.’ However, missing a deadline was never an option. Not only due to my own sense of responsibility and pride in my work, but also because I have felt the effects of others missing a deadline as I edited a monthly show together. Somehow at the end of the month though, the video was completed and not just finished but completed in a format that met my high standards. Each month looking back I wondered how the video was completed. This month when a week before the deadline the vast quantity of great soundbites caused me to change this look at the digital footprint from a two minute feature to a seven minute mini documentary. I worked hours and hours on this project. All else took a back seat as much as possible to so I could educate people about this new phenomena in our society that can be a wonderful tool in finding opportunities. With this being the final video in my Ladue View career, someone asked me how long it takes to edit one of my videos. When I started to calculate the hours that one of my monthly stories has taken to create, not just a video I produced at a convention, I decided I don’t really want to know. Not only could I not add up all the hours, but more so the hours would be intimidating. I know I spend a lot of time producing videos. It consumes me to the point hours have passed and I have no idea. But its passing time doing something I love to do. Whether I know how long these videos take to produce or not, I am aware of the vast percent of my time they take up. However, looking back on the numerous videos I produced this year, I would not have wanted to spend my time any other way. “I walked in the valley of the shadow of death.” The streets of Auschwitz embody the words of the funeral psalm. On my third visit to this nightmarish place, I am not here to mourn. Today, I do not feel a dead weight in my gut or nauseous dread. Instead, I join over eighteen thousand people to march in the celebration of life, acceptance, and diversity. Throughout my first visit, the constant downpour of freezing rain chilled me to the bone as I walked in the Nazi’s streets of murder, under the shadow of the grey clouds. In simple terms, Poland is my least favorite country. The country not only triggers memories of the Holocaust at every turn, but is struggling to rebuild itself after decades of Soviet rule. Still, choosing to come back to Poland was easy. I chose to return to replace grief with a celebration of life and join the thousands who oppose Anti-Semitism. Even more so, after itching for a video camera on my first trip to Poland, I came to document the sights and experiences of the March of the Living. I believe every person needs to view the consequences of hate in order to become intolerant to intolerance. The opportunity to return to Poland with camera equipment allowed me to capture my experience and share it with those unable to visit the sites themselves. As we march out of the rusted gates of Auschwitz, I feel strength within me. Pride. Walking in the place where Hitler failed to confine us, I am surrounded by Jews from around the world. On our journey towards the death camp Birkenau, my attention flits to the voices of the marchers in front of me. “All my life I’ve been waiting for, I’ve been praying for, for the people to say that we don’t want to fight no more, there’ll be no more wars, and our children will play. One day!” my fellow marchers sang. Hope wells within me at the lyrics of “One Day” by popular Jewish American musician, Matisyahu. My heartbeat seems to pound alongside the rhythm of the music. The joyous singing epitomizes today’s atmosphere. Camera strap secured around my neck, I slink off to the side of the crowd and stride ahead of the singers. I pause and turn around before tucking my arms to steady the footage. As I watch the other marchers through both my own eyes and the eye of the camera, the moment transcends me. This is not just about capturing memories for my own sake; it is about education, telling a story, and giving people a personal connection to new experiences. It is about imparting the knowledge and incentive to make a difference. I will always run ahead of moments to film them. But running ahead of the moment does not mean missing the experience. There will always be the instant where the marchers pass me by, and that short window of time not only enhances my own life, but becomes yet another story to share. As the Chief Editor of Ladue View this past semester, one thing the executive producer and I instated was to end each show with a commentary. We aimed to make our audience a part of the show whenever possible and to give voices to those who do not possess the video skills to broadcast their opinions. When necessary, our producers stepped into to share their own messages. This simple format that really focused on the words each person shared truly became one of my favorite parts of our show. I hope that when I watch Ladue View next year as an alum of the program, the producers who continued on in the program will continue to make the Commentary an integral part of each month’s show. This past month, on show critique day, one of my peers complemented me that this video on the “Give Kids a Smile” organization demonstrates how I always find interesting story. My peer went on to ask how I found these stories. I wanted my response to be how could I not find interesting stories. Stories just waiting to be told are all around us. Every person has a story within him or herself that has the potential to inspire others. There are so many unique non-profit organizations that are telling their stories wherever they can. Making a video to about a non-profit organization hopefully spreads the organization’s message to new people and possibly inspires them to take action and help. Give-Kids-A-Smile is an incredible organization. Professionals from all around my hometown give up their time and resources twice a year to give back to their community. It was a true pleasure to finally be able to share this organization’s story with more people. I did not enjoy producing this video. Plain and simple as that. It wasn’t a story I found and was fascinated by inciting a desire to share it. Rather, Cooperating School Districts asked my teacher to select a student to produce a promotional video for them. I may not have enjoyed this process, but it was a learning process to work with, for lack of a better word, a client. It surprised me that even people who encourage video production by running a contest, have no idea what goes into making a quality video. It pushed me to get creative and seek out the footage I needed with perseverance. When I was told I there was no way to get me the files of winning videos, leaving me with no b-roll footage, my teacher got Schooltube the only host to give us the files. After that I had to get creative. I tried new techniques for mixing standard definition with high definition widescreen video. In a pretty dry video to start with, I am happy with the product. In my opinion it achieves its purpose: to share the message of this contest and to spread the knowledge about this competition. There is a power to filming true events. Personally, I am drawn to telling true stories. Every person has a story to tell and I love helping a person discover that story that can inspire others. For this semester's final I was given the prompt to take a 60 second song and create a story out of it. I chose to use this as my first experience with creating a fictional video. It was a great exercise on storytelling through images and sounds but no dialogue. The power of video is that we not only hear words, but we can see what the words describe and hear the sounds of the environment. This exercise pushed me to tell a story without relying on words and description. I focused on showing my story to the audience, rather than telling it. This project made me think outside the box and really put myself in the audiences perspective to make sure that the images and sounds were telling a coherent story. While I still prefer creating non-fiction videos to fictional ones, this project made me a greater respect for those who create fiction. Those who create fiction are charged with the task of creating reality. A fictional story can easily become unbelievable if some part of the reality in the film seems fake. My brother is a narrative film maker. This project gave me a better respect for the effort that goes in to his films. He not only has to create the characters and formulate a story, but he has to find locations, choose wardrobes, dress the set, and so much more. This project was just a glimpse into his world as I tried to create a story rather than discover one. Watching the short films created by the other students in class reminded me how unique each of our minds is. We each took one of three songs and created a completely different story. Music is the universal language that invokes emotion, yet different emotions were invoked from each film even those with the same song being used. It's truly fascinating to see the story each of our mind creates on its own. I don't know that I will create another short narrative film any time soon, but creating narrative videos was definitely a great exercise to enhance my storytelling skills that I can use in nonfiction videos. This month I took on the endeavor to create three videos in the time students normally create one. Somehow I ended up creating six videos. There are so many stories to tell, and this month I had two many story ideas to choose just one. Somehow though some of the stories ended up sharing a theme, accepting yourself and others. Meeting Marc Elliot reminded me why I create stories. Marc is a truly inspiring individual. He has taken his challenge of living with Tourette's Syndrome and used it to inspire others to become more tolerant of others. The GSA Allyweek showed me the great talent hiding within the student body of my school. These students are not only extremely talented individuals but they are passionate ones who are dedicated to supporting others and standing up for people. Finally, a commentary about the true meaning of intelligence also promoted the message of accepting yourself for who you are as then you can best express your individual intelligence. I did not go in to these stories knowing there would be a theme, but each of these stories surprised me in their own way. Through the six videos I created this month, I learned a new technique how to effectively use natural sound and broil. Through using nat sound and broll without soundbites throughout the story, there was more depth to each video and the atmosphere of the event came to life more. It was a lot of work to complete six videos in the time most people make one, but it was not much of a challenge, and I am not sure how I will return to one video a month. In truth, I probably won't. There are so many stories to tell that don't get told, so if I have the time it would be illogical not to tell them. This past month has definitely been a crazy busy one. From going to the Journalism Education Association Convention in San Antonio to my endeavor to create 5 videos in one month, there has not been a moment to spare. After the deadline night last, night things are finally beginning to calm down, although, the world of broadcast journalism never truly calms down. There's a lot of new insights on the new videos to come soon, but for now check them all out at the Video Archive page. Last night, during the presidential debate, I had a revelation completely irrelevant to the candidates playing the blame game. After Romney’s ridiculed remark about cutting funding for PBS and therefore Big Bird, my twitter feed was filled with comments. Within moments of his comment, people were tweeting pictures from tumblr of Big Bird in a soup kitchen line. Taking a step back, I realized how twitter and tumblr have changed the way we watch television. As interested as I was in the candidates giving what they thought was the best comment to win them votes, I was just as interested in the thoughts of people in this society who express their views through twitter and tumblr. I am a big fan of going to midnight openings of movies. I love the communal experience of going to the theatre and feeling that thrum excitement bursting from the audience. Every experience of viewing a movie is different depending on the audience. Some laugh more, some cry more, some are just all around more enthusiastic in their responses to the movie. Twitter and Tumblr have captured this communal experience of the theatre and brought it into our homes. When I watch Glee, I continually refresh the tumblr track for the show to see other fans reactions. I now have the experience of being in a theatre and experiencing Glee with an audience from the comfort of my own living room. This morning on the news, one anchor said that over ten million tweets were sent during the hour and a half of the presidential election last night. 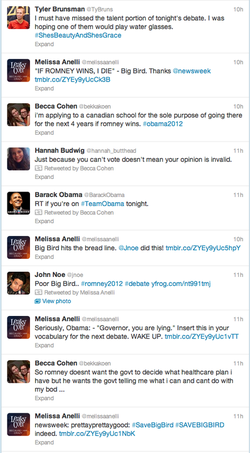 The anchor then went on to comment that this was the most tweets ever sent during a presidential debate. While Romney and Obama argued last night over the degree of changes both positive and negative over the last four years, society demonstrated how it has changed in that time period too. Four years ago, twitter was not part of our everyday lives. For me, this whole experience of using twitter and tumblr as I watch television is a new phenomenon in the last six months. This communal experience of watching the presidential debate through the eyes of our fellow citizens, can only enhance our society. Last night there was dialogue between Romney and Obama and there was dialogue between Republicans and Democrats through their comments on social media. The convergence of ideas on social media sites, allows us to better understand the thoughts of our peers. I’m excited to watch how social media has changed our lives in the 2016 presidential election. I guarantee you it will be a totally different experience. Reading can be used in every facet of our life. Through reading we learn how to communicate with others and gain a plethora of knowledge. Video creators must read. Through reading we learn through example how to tell a story. We observe how to pace a story and make it climax. Through the experience of reading we learn how stories can emotionally affect us and change the world. In the last two decades, J.K. Rowling has inspired a new generation to love reading again. J.K. Rowling’s fantastical wizarding world shows drew people into the art of storytelling. What many people do not know, is that while J.K. Rowling’s books caused reading to explode, her books also inspired an outpouring of creativity. The Harry Potter Convention LeakyCon, is an example of this. LeakyCon is a convention started by the Leaky Cauldron fan site. The convention emphasizes three things: Charity, Community, and Creativity. LeakyCon was an amazing weekend with a highlights such as A Very Potter Senior Year, the final segment in Team Starkid’s Harry Potter Musical Trilogy, a panel with the Harry Potter Actors, and the Esther Earl Rocking Charity Ball. Just as amazing as the variety of programs was the incredibly friendly fans who all gathered to celebrate what they love. LeakyCon was at its core a celebration: a celebration of ourselves, a celebration of storytelling, and a celebration of Harry. Personally, LeakyCon reminded me why I love stories and why I am drawn to telling them. Hear one person's experience of visiting the Nazi Death Camp Majdanek. This year you have taught me not to use clichés so I’m sorry but there is one very fitting to the situation. A picture is worth a thousand words. This very over used and cliché phrase is so true. For the first paper this year, you asked me to write a personal narrative about any personal experience. You asked me to tell you a story. At the core of every video is a story so I wish you would have allowed me the opportunity to create a video to tell my personal experience. My video would have incorporated writing, as I was required to write voice-overs to narrate the images. Writing voiceovers allows me to practice being concise in my writing, as voice-overs need to be short, to the point, and powerful. With limited words, one must really learn what the most important elements of the story are. The greatest benefit to making a video is that I can show people real images. I film 24 frames (pictures) a second. If you multiply this by two minutes that is 2880 pictures. If you then apply that a picture is worth a thousand words, a two minute video is worth 2,880,000 words. Writing is all about choosing words that best portray a story. Well, creating videos is all about the small choices too. When I create a video choose every shot out of a multitude of footage, I choose fitting music, I choose coloring, I choose motion of pictures, I choose words in my voice overs, and I choose the tone of voice of my voice overs. Next time you assign a personal narrative essay, I urge you to allow students the opportunity to create a video of their story. They will not only work on the skills you want them to learn when writing a personal narrative but they will learn so many more applicable skills. This year I have really delved into two new passions, Broadcast Journalism and Israel Advocacy. To further my engagement from Israel after returning home from my first trip there and discovering the necessity it is that Jews in the diaspora educate and advocate for Israel’s existence, I received a national internship with the Chicago I-Center. When deciding upon a project for this internship I decided to combine my love for Israel and my love for broadcast journalism. I decide to produce a video that would encourage more teens to go on a trip to Israel. In the video three of the national youth organizations that organize Israel trips are represented. I decided use myself, as one of the interviewees so that the trip I went on would be represented. Interviewing myself was an experience and not one I would like to repeat again. Setting up my shot of myself was extremely complicated, as I had to go back and forth between moving the camera and seeing what the new shot looked like. Still, I am very proud of the way this video turned out. I hope that when people see this video they understand the impact of a trip to Israel and are encouraged to go themselves. So far, this video has been shown at a preparation meeting for six teens who are receiving scholarships to go to Israel this summer. I hope to see where I can take this video and get it seen my many teens to increase the number of teens traveling to Israel and then the amount of teens who are passionate about Israel’s existence. Children are growing up in a profoundly different world from the one their parents knew when they were teenagers. Annie Fox spoke to Ladue parents about ways they can adapt their families to the twenty first century. After spending months on creating Never Forget, producing a short simple video on Annie Fox was very strange for me. I really had to get back into the mindset of creating short news features for TV. It felt like such a simple project being only two and half minutes. The one big challenge of this video was the lighting of the room, but in environments like that you make the best of what you have. After a year and a half in the broadcast technology filming an event where I get all my footage at once is down to a method that is second nature. Its nice that as my skills develop I have gotten to the point where most of the technical parts are second nature and I can focus on helping Annie Fox share her message of bettering parent-teen relationships through adapting parenting to the twenty first century. The process of producing Never Forget began May of 2011. For my final project in broadcast technology 2 I was given the prompt to create a video on the topic of the september eleventh attack. I immediately thought of a family friend, Jeff, who years earlier had told me the story of his survival from the world trade center. Since I was on a time constraint I interviewed his wife Ruth about her experience as a spouse of someone in the towers. Ruth’s perspective told an amazing story as she was one of the many women waiting at home with no knowledge of her husband’s whereabouts during the attack. Since that time I had always had the desire to interview Jeff and combine the two interviews. The story of the Springer family was one that needed to be shared. In September, I interviewed Jeff and still struggled to cut his story down to a length useable for a tv feature story. After writing a blog about all the information I had to cut out of Jeff’s interview, my teacher approached me with the opportunity to take a few months off from monthly projects and use that time to create a documentary. I jumped at the chance to really tell the Springer’s full story, not yet aware of the challenge making a documentary is and not yet knowing how this opportunity would totally change my life. The first two months I spent my time working out the order of the story. Picking out the best sound bites and seeing how different orders effected the story. Within this process I learned so much about the importance of organizing clips within the Final Cut Bin and how to do this more efficiently. By the beginning of January I had a rough cut that was forty minutes long and didn’t even include the interview of the Springer’s son Zac, who I had interviewed over winter break. Zac added another layer to the film. While he did have more at stake than the average person on September 11, he had the relatable experience of watching the event on TV from another city. He had the experience most of the viewers of the documentary could relate to and use as a segway to remembering their own experiences. January was crunch time. I lived in the editing room. I had to cut the film down which is one of the hardest and most painful parts of editing but makes the story better as a more concise story is a more powerful story. I had to find footage of september 11 that I could legally use under copyright laws. I found royalty free music and experimented with different songs to throughout the film to find the perfect fit. I researched quotes and came up with an idea for the intros and transitions. It was a long process where I lived and breathed the documentary but it was totally worth it. Every weekend I would burn the full project onto a DVD and watch the movie it straight through taking notes on what I wanted to change or add. I could not be happier with the final product of the documentary. At the core every documentaries purpose it to share stories, to educate others through these stories. I think Never Forget does this. It shares the story of one family on September 11 and hopefully it helps people never forget the tragedy of september 11. It is now May yet again and as I look towards my future in broadcast journalism and documentary filmmaking I look forward to the editing of my new documentary that is currently in the works. If the process of making Never Forget has taught me one thing it is that while fictional movies can be powerful why tell a fictional story when there are so many untold truthful ones that can teach us so much. Never Forget tells focusing on one family who was deeply impacted by the events that occurred on September 11, 2001. Over the weekend, this documentary was picked up by givcause.com and featured as part of their Documentary Saturday. If you have never been to givcause.com, it is a website that features videos and documentaries that have a cause. Many of the videos on givcause.com are connected to non-profit organizations. While Never Forget is not associated with a non-profit organization, it tells an important story. Like other documentaries, Never Forget not only documents history but focuses on the humanity we sometimes lose when remembering our past. In creating this documentary I hoped to share this family’s amazing story about the events that took place on 9/11/. I thank Givcause for assisting me in sharing this story with more people. Stay tuned for some behind the scenes insights in what went into the making of Never Forget. When I was given the prompt to make a video about myself , about who I am, I was at a lost for what to do. I know who I am, but I am not one thing. My interests and characteristics are not something I could truly sum up in a short video. As I though more about the aspects of myself that people at school do no see, I realized that people do not know how I came to be me. They do not know the multitude of experiences I that shaped me. One such “experience” would was my five year struggle with chronic pain syndrome and my current struggle to overcome the effects chronic pain has had on my body. When I was nine years old I started having really bad pains in my left foot. Pains that were not designated to one area and I could not pinpoint for the doctor. I saw tons and tons of doctors but all of them were stumped. No one knew what caused my pain, so they could not cure it. I went to physical therapy for pain treatment and took pain medicine to help deal with the pain but it was still a constant force in my life. I was never without pain. Today, I can’t even imagine being in that amount of pain. The pain I felt was not comprehensible to the average person and after being without this pain for the last three years, I cannot imagine feeling it again. Through elementary school and middle school I struggled with the pain and the effects it had on my life. I could not participate in P.E. or any type of physical activity so I grew more involved in areas. I studied more, I made more art, I bettered my piano skills, I read more books, and I grew to love the T.V. series “Friends.” Looking back, my battle with chronic pain has shaped me. I am not an athlete. Chronic pain stole the opportunity to love sports and the enjoyment of being active. Eventually, the pain spread from my back. On different days the pain was centered in different areas of my body. I had pain in my feet, in my knees, in my back, in my shoulders, and in my neck. The pain stretched from my toes through my head. It was exhausting to deal. On October 1, 2008 my mom asked me to see a new doctor. I had seen so many doctors who had run invasive tests that all came back negative so I was not enthused. After fifteen minutes of explaining the history of my pain to the doctor and ten minutes of him looking at my legs, back, and how I walked, he told me he had a diagnosis and a cure. At some point I had twisted my back, which caused my to walk differently which caused me to have pain. The pain caused me to stop exercising which caused my muscles to get tighter and made me walk even more differently. This in turn caused even more pain. For years I had been stuck in this vicious cycle, but through intense physical therapy I was able to escape the cycle. I was taught how to walk again, how to sit, how to stand, how to move around. After a year of physical therapy the pain was gone. Once in a while I will do an activity that causes a flare up of pain that will go away in a few days. The pain is gone, but it committed me to the subjects I was already interested. In losing the ability to run, I passions became more specialized. Today, I am passionate about my Judaism, I am passionate about becoming a secular and Jewish educator, I am passionate about storytelling and broadcast journalism, and I am passionate about helping others. Through this experience, I learned to be strong, to be dedicated, and how to overcome challenges. demonstrated how accepting and how much of a safe haven camp rainbow really is. not able to use the opportunity to get more footage because I only had one tape. love about the technique of this video and improve for my next project. As we draw nearer to the tenth anniversary of the September 11th attacks, there is a common urge to pay tribute to this day. For me, I needed to commemorate this day through the broadcast medium. Since my summer trip to Poland where I visited concentration camps, I have been itching to get a video camera back in my hands. To share a story with people. Through interviews and visual story telling we preserve history, we remember it. Last May, I started a story. Years ago, Jeff Springer told his story to my family at a passover seder. His story, details slightly blurred, has always stuck with me. As I went to pay tribute to 9/11, I felt that his story needed to be shared. Last May, I produced a story from Ruth’s, his wife’s, point of view. What was it like not knowing the fate of her husband on 9/11? Ruth’s story was an amazing one to tell and I knew Jeff’s would be too. Now, months later, I returned to their story. In August, I sat down with Jeff for an hour interview. After going through the editing process I am happy with the product I made and the story I was able to tell. However, some information was lost as I went through the heartbreaking process of cutting out footage. Information not included in the interview included the fact that Jeff was responsible for sixty people on his floor and they all survived. His floor was destroyed as the plane hit just a few floors above his. The woman in the stairwell whom Jeff and his associate Frank saved had a sister who died in tower one. This woman went on to adopt her late sister’s child. Jeff provided so much information in his interview and I could have taken so many angles on this story. The story seen in the video, was at the core Jeff’s story. His descriptions gave us vivid details about the attacks that only a person in tower could have provided. Hitting export from Final Cut to make a presentable QuickTime movie, I hope to have done justice in telling Jeff’s story and that in my own way, I have paid tribute to all that was lost on September 11, 2001 and all that was saved. Welcome to the Wild Rose Productions blog. My name is Samantha Weil and I am a broadcast student. I first entered the broadcast technology 1 class to complete the required practical arts credit. However, I immediately feel in love with the video medium that at its core is all about telling great stories. I am now in the advance broadcast project and am excited to expand my skills and tell some amazing stories. Follow me as I delve more into the broadcast journalism world with video projects and blogs!